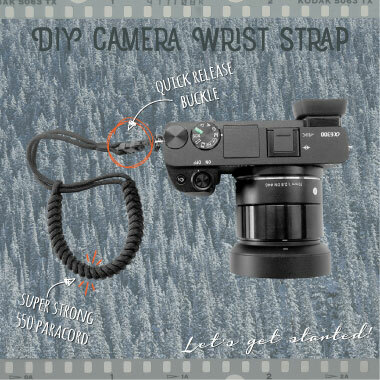 Curious to find out how to make a survival bracelet? There’s no denying that paracord is always handy to have, especially when you’re out adventuring. With a breaking strain of around 250kg it could quite literally save your life one day. Not to mention the hundreds (if not thousands) of less extreme things you could do with it, it’s always a good idea to carry a length of paracord on you. The most traditional way to do so has to be the good ol’ survival bracelet. 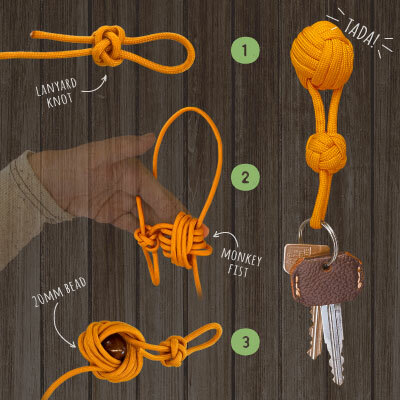 Have a look at our infographic tutorial on how to make a survival bracelet and knot your way to one of the most useful adventure accessories. Of each color you’ll need approximately 1.5 meters. Smaller wrists can get away with less, but 1.5m is a safe length and since paracord is pretty cheap, it’s better to be safe than sorry. 1. First things first, we’ll need to merge together your two strands of paracord. I find it easiest to hold each end on either side of a flame. Get someone to hold a lighter up for you or, if you’re alone, light a candle. Wait for the ends to show signs of melting and press them together. If you want, you can roll the newly merged section between your thumb and index finger while it’s still malleable to smooth it out. Careful, it’s hot! Give your fingers a good sloppy lick to prevent them from getting burnt and never attempt if the cord is still bubbling. Give a good tuck on each end to check if your connection is secure. 2. Fold your paracord in half to create a bight (rope-nerd-term for a rope folded back on itself). Tuck the bight through one of the slots of your buckle (front to back) and pull the ends of your cord through it (this knot is also known as a Cow’s Hitch). To make it easier to hide the connection later on, make sure it’s at least a centimeter bellow the buckle. Decide now which color you want on the inside since this the color you should use for you Cow’s Hitch. 3. Tuck your two ends through the other slot of buckle, front to back. Put the bracelet on your wrist to measure out the girth your survival bracelet is going to be when it’s done. Make sure it’s on the loose side since it will bulk up a bit by the time we’re done. Once you’re happy with the size hold the rope in place to make sure it doesn’t loosen up on you and unclip the buckle to get the bracelet off your wrist. 4 & 5. Take the color cord that will be your inside color (in my case that’s green) and place it on top of the two cords in the center. Take the color cord that will be the outside/accent color (yellow for me) and pass it underneath the two cords in the center. You should now have two loops with the center cords passing though them. Tuck the end of the inside color through the loop of the outside color, front to back. And then tuck the end of the outside color through the loop of the inside color, back to front. Now pull both ends tight. 6, 7 & 8. Keep repeating step 4 and 5 over and over until you can’t fit any more knots onto your bracelet. Each time your inside color should lay on top of your two center cords and the outside/accent color should pass underneath. After each knot make sure to pull it super tight. The tighter your knots, the neater and more uniform the end result will be. It’s also not a bad idea to regularly try your survival bracelet on to make sure it still fits as you want. It’s easy to accidentally shorten the bracelet, especially during the first couple of knots. Or to underestimate how much it will bulk up in the end. 9. If you can’t fit any more knots onto your survial bracelet, flip it around. Wiggle your long nose pliers (or a sturdy set of tweezers) underneath the first horizontal section of cord. Grab hold of the end of the accent color (which will be the same color as the horizontal section you just wedged your pliers under). Pull it through all the way and as tight as you can. Leave the other color for what it is. 10 & 11. Wedge your pliers under the second horizontal piece and this time grab the ends of both colors. Pull them through and as tight as you can. Do this to a couple more horizontal pieces. If you made your knots nice tight you’ll find this becoming increasingly more difficult after 4 horizontal pieces. Which is a good sign! It makes sure your survival bracelet won’t come undone. 12. Snip the excess cord off and… Voila! You’re all done. You can either leave the ends as they are (they shouldn’t unravel if your survival bracelet is nice and tight) or melt the tips if you want really secure the crap out of it. If you decide to melt the tips, make sure to smooth and flatten them out as much as possible to prevent skin irritation. And, that’s it. You’re done! If you got stuck anywhere in the process, make sure to let us know in the comments below and we’ll help you out. We are doing this as a Cub Scout project & we’re wondering how you get it to lay so flat? It seems like our knots are so tight that the bracelet is twisting. Any advice? I think it might be the quality of your paracord. 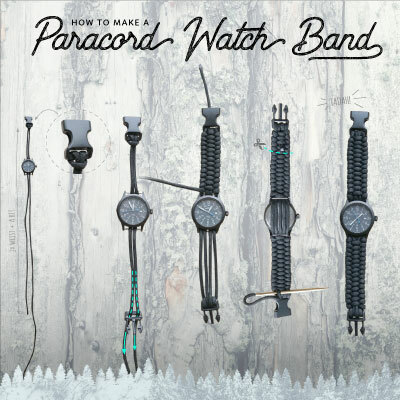 I get the paracord I use in my tutorials from here and it’s really great stuff. The bracelet doesn’t need any guiding to braid straight. (But it is an Aussie supplier so that might not help you out if you live elsewhere.) I tried tying a bracelet with much cheaper paracord I picked up somewhere and it started twisting right from start as you described. If you’re keen to hunt down better quality stuff to make it easy for the kiddies, try some military grade (or mil-spec) paracord. I did manage to get a straight bracelet out of the cheap stuff in the end by counter-twisting it after each knot. If you leave that till the end, the bracelet seems fixed in place and it gets harder to straighten out. It takes a lot longer and is a bit of a pain but it might be a good option if you don’t want to spend the money on new and (probably) more expensive cord. Hope that helps you out a bit. Let me know if you’re still having troubles. I’m happy to help best I can. I can’t get the two strands to melt together. Any suggestions? I haven’t tried it myself, but it looks promising. Thanks for sharing. I used your technique to make a short handle for a small camera case. It worked great.